We've talked before about biopics and movies based on true stories and my specific feelings on the subject. I think that it should be a law that any real-life movie must include a documentary on the Blu-ray Disc which gives the exact, specific details on what really happened. Actually, I would love for these movies to have "Pop-Up Video"-like titles which say things like, "Yes, this actually happened." There's nothing worse than watching a movie and wondering "Is this true?" or worse, walking away feeling that you didn't learn anything. Foxcatcher is one of the worst perpetrators of this that I've ever seen and it makes one wonder what "Based on True Events" actually means. As Foxcatcher opens, we are introduced to Mark Schultz (Channing Tatum), an Olympic Gold Medal winning wrestler, who is preparing for the next games. He trains with his brother, coach and fellow wrestler Dave Schultz (Mark Ruffalo). Mark lives a very modest and meager life, and while he's a gifted athlete, he doesn't come across as someone who knows a lot about the world. One day, Mark is invited to meet John du Pont (Steve Carrell), a millionaire who is heir to the du Pont Chemical company. du Pont is a fan of Olympic wrestling, and he wants to create a training center on his sprawling Foxcatcher estate. Though somewhat confused by the offer, Mark can't resist the money involved, although he hates leaving his brother. Once he's moved it at Foxcatcher, Mark is taken under the wing of du Pont. But, we soon learn that du Pont is a very eccentric man who is prone to bizarre requests and fits of jealousy. Foxcatcher is based on the real-life story of Mark Schultz and John du Pont which ended in murder. I can remember hearing about this when it made the national news in 1996. As I didn't recall many (if any) of the details, I was looking forward to this film so that I could learn more about the story. Well, I probably now know less. Above, I implied that is one of the worst biopics ever made and that is not hyperbole. Director Bennett Miller has treaded these waters before with Capote and Moneyball, but here he has decided to not only play it fast and loose with the facts, but to leave the audience in the dark about many key issues. The movie gets off to a great start by assuming that the audience is familiar with Greco-Roman Wrestling. Now, the sport isn't the most complicated in the world, -- it doesn't have all the rules or vernacular as something like football -- but it's more than just rolling around on the mat with another dude. But, the movie never tells us a thing. We learn next to nothing about Mark and Dave's past. We are never told why du Pont is interested in wrestling, save for the fact that he's a patriot. The movie commits one of the cardinal sins of "real life" movies by not telling us when things are happening. Once Mark moves to Foxcatcher, there is a jump in time where we see that his demeanor and his devotion to training has changed, but we don't know how quickly this occurs. Likewise, the third act has a huge time jump, but it's never detailed. And then there are lots of little things like why does du Pont have state troopers on his property for target practice, or what's with the tank. As if all of this wasn't frustrating enough, the biggest questions surround the du Pont character. Carrell portrays the man as if he has some sort of learning disability or social anxiety. (The angle at which he holds his head and his lack of eye contact reminded me of the Nathan character from South Park.) In the film, du Pont speaks very slowly and doesn't seem to understand social etiquette. We are also rarely made privy to his motivations. He simply does things and we are left to wonder why. His feelings of jealousy are fairly clear, but the film is also riddled with behaviors which are never explained. So, this raises the question; Did Carrell do a good job? The answer is, I don't know. He has certainly created a character, but it doesn't seem to relate to the real du Pont. I know that some felt that Carrell was an odd choice for this role, but if you've watched The Office, then you know Michael Scott's penchant to jealousy and the need to be in control aren't that much different from du Pont's. While Carrell is nearly unrecognizable under his makeup, the same goes for Ruffalo, who definitely turns in a great performance. Foxcatcher had all of the makings of a great movie -- murder, sports, and an eccentric millionaire. However, the result is a nearly pointless movie which somehow sensationalizes the real-life story while at the same time removing any drama from it. We are simply forced to watch a bunch of characters who we don't know doing a lot of things which are never explained, all while they all wear garments emblazoned with the Foxcatcher logo. The bottom-line is that it's not a good sign when you are watching a biopic and you can't wait for it to be over so that you can go online and read the real story. 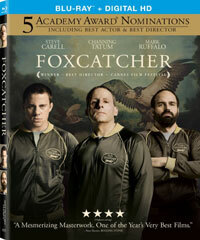 Foxcatcher may be Tatum's most believable role to date on Blu-ray Disc courtesy of Sony Pictures Home Entertainment. The film has been letterboxed at 1.85:1 and the Disc contains an AVC 1080p HD transfer which runs at an average of 25 Mbps. The image is very sharp and clear, showing on overt grain and no defects from the source materials. The colors look good and the image is never overly dark or bright. The level of detail is excellent, as the special effects makeup holds up to the HD scrutiny. The depth is good as well. The Disc also carries a DTS-HD Master Audio 5.1 track which runs at 48 kHz and an average of 2.2 Mbps. The track provides clear dialogue and sound effects. The musical cues fill the speakers and add presence to the track. There are several moments where we are treated to sounds from the left or right front channels to highlight audio coming from off-screen. The surround sound effects come into play with crowd noises. The Foxcatcher Blu-ray Disc holds only a handful of extras. "The Story of Foxcatcher" (16 minutes) is a making-of featurette which offers comments from Bennett Miller, as well as Carell, Ruffalo, Tatum, and other members of the creative team. The piece touches on how the project came about, the cast, the special effects makeup, the wrestling training, the production design, and Miller's directing style. This gives us a nice, brief overview of the movie, but we still don't learn anything about the real-life story. The Disc contains two DELETED SCENES which run about 5 minutes. One of these sort of answers a question from the movie...and then asks a new one. The final extra is the THEATRICAL TRAILER for the film.